Looking at the science of temple-building, Sadhguru explains that traditionally in India, temples were never a place of religious prayer or worship. 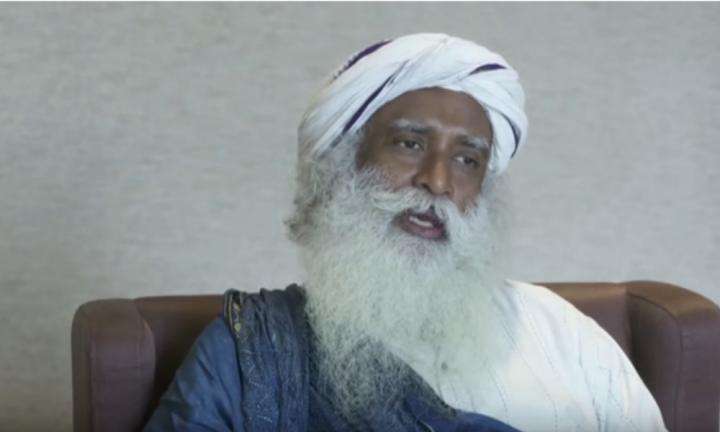 Looking at the science of temple-building, Sadhguru explains that traditionally in India, temples were never a place of religious prayer or worship. The temple is essentially a device created to come in touch with the divine. Sadhguru: No. I did not say temple in every city, did I say that? I said you must... your home, your... your city, your town and your state and your nation and the world should become like a temple. That cannot be done by building more temples; that can only be done by you being in touch with the Divine. And anyway about the major wars, you need to understand this, there never was any kind of religious war till about two thousand years ago, okay. Not even two thousand, about sixteen, seventeen hundred years ago, there never was, because in the East, in this part of the world, there was no such thing as religion. If you do not know this, this is the only religion-less culture, godless culture. This may be little scary for people because we have thirty three million gods and goddesses in this country. That happened when our population was thirty three million. Since then (Laughs) our population has increased but we did not create enough gods and goddesses because of Western influence we started feeling ashamed of gods and goddesses. If each one of you – there is something called as Ishta Devata, you can create your own God. You don’t like any of the things available, you can make a tree in your house, God. You worship it, nobody will think it's an odd thing in this country. There is a rock in your garden you can worship it, nobody will think it's odd. You can worship your mother, you can worship your wife, you can worship your child, you can worship a cow, whatever you want but the important thing is, there should be devotion in your heart because if there is no devotion this... with this much intelligence, this animal will go crazy. It needs devotion. Devotion means not about God, about you, isn't it? Is devotion about you or about God? Whose quality does it change? Whose quality does it change, your quality or God’s quality? It's about you. It's about transforming you into a certain level of sweetness which cannot be contaminated from outside. This is what devotion means – that you are devout means you have created a certain sweetness in your emotion which cannot be contaminated, which cannot be made bitter by somebody else. If you love this person, if this person gets against you, your love becomes poison, isn't it? Yes or no? So devotion is that dimension of intelligence where you know how to manage your sweetness irrespective of what the world is doing to you and the people are doing to you. If you don’t have this capability, you will not go very far in this world, isn't it? If you have the fear that you could become bitter, you will only take baby steps in your life. If you know, ‘No matter what happens this is how I am, it does not matter what happens to me in this world, this is how I will be,’ if this assurance you have, only then you will take full strides into the world, otherwise you will always take hesitating strides into the world, isn't it? So there is no – there has never been a religion in this country, I want you to know. What you call as Hindu is a geographical identity. Anybody who is born in the land of Indus is a Hindu. You can believe in God and be a Hindu; you can disbelieve in God and be a Hindu. In your house if you have five people, five people can worship five different types of gods and still be okay with each other. This is not allowed anywhere else, do you understand? If you worship another god you are dead. So because of those kind of cultures, wars came, otherwise here, where is the war? Where... where ever there was a war on religious basis, tell me? There’s never been. It's only the import of religion which has done that, isn't it? Because, ‘My way is the only way’; only because of that. In the same family, two people can worship two different kinds of gods and we have no issues, isn't it? This is not allowed anywhere else because here we know that god is man’s making. It is a device that we have created to touch the Divine. Yes. If you do not understand this, how did all the gods come? We want to create devices to somehow touch that dimension which is the basis of creation. So we evolved a whole technology of God-making - not just creating forms, energizing them in such a way that it will assist you to touch that dimension of life. Everything is same energy. If you take some filth from the gutter and throw it at the root of the mango tree it becomes a mango. The filth and the mango are same, isn't it? So why don’t you just eat the filth, not the mango? No, you cannot eat that, but the mango you want to eat. This filth has been transformed into such sweetness, isn't it? What you call as earth that you walk upon is what is sitting here as your body and my body, isn't it? Yes or no? So it is the same thing but it can be transformed into different dimensions of sweetness and energy and possibility, though it's the same thing. So understanding this, we evolved a whole science of consecration where we know how to turn a stone into Divine. It is not a simple process. It is not just by belief, it is not just because of… somebody believes it, it will reverberate. Today people are coming with meters, okay. I’ll tell you - recently we consecrated Adiyogi Alayam. I wish we could show it to you. Just last week, about eleven thousand people, that's all we could allow. Today I went to the golf course, that lady was coming and crying to me who was working there, ‘Ayya, I wanted to come but they said it's all full’ – so many people could not come because eleven thousand people is all that could house in the ashram. So after that I said, ‘No meters, don’t bring any damn meter anywhere near us’ because it will only mis... if I am dead what to do? If this is being dead, I think it's fine I am dead, okay. Yes. Am I dead enough? (Few Laugh) So they said they will bring this some Lecher antenna and they want to measure the energy, whether the consecration is real or is it fake. So I said, ‘Okay, you test it beforehand.’ They tested it. They said, ‘It's all some one million units of magnetic... electro-magnetic force, something. I said, ‘Fine, you just test it.’ And we just started. Then he got very excited, ‘It’s become ten bill... ten million.’ I said, ‘Hold it, your meter may break.’ It became one billion, it became hundred billion, and after that the meter could not show beyond that. If you step out of the hall, it is still one million. If you step into the hall it's over hundred billion. So there is a whole science as to how to energize a space. (Claps his hands) Simply you can energize this space, make it crackle. You can take any object and make it. For example, if you are sensitive you hold this in your hand, I will just hold it in my hand for one minute and give it to you, it will feel different. Only problem is, this object will not be able to hold that energy for too long, after some time it will dissipate and again become a metal plate. If you create this form with the necessary care, you can energize it in a way that it stays for a long period. If you do it to an object which is made of solidified mercury – oh, that itself is a problem. Modern chemistry does not believe that you can solidify mercury unless you take it to minus thirty two degree centigrade. You come, I will show you – probably for the first time it's on the video, I am actually solidifying mercury in my hands. Liquid mercury is becoming solid, right there in my hands. I will show you solidified mercury, any number of objects in the ashram. This is one object you cannot fake because the highest specific gravity for any substance found on this planet is mercury. It is 13.92… is its specific gravity, which is almost fourteen times heavier than water. No other substance on this planet weighs that much. So you cannot fake it. Weight to volume if you check it, it's right there. So this... this object... this linga which is just about twenty three inches tall, weighs seven hundred and fourteen kilograms, okay. You cannot fake it because it is mercury and it's in room temperature. They will say it is not possible. Well, it's sitting in front of your eyes. This is an alchemy. This is an alchemical process in this country where we always solidified mercury. We consume mercury as a part of… Siddha vaidya is using mercury extensively. Everywhere in the world people say it is poison. So why I am saying this is, right now our understanding of science is too rudimentary. It is only to use everything, not to enhance life, only to use life. If you go on using every other life, won't you start using this life and this life also? Will you stop? Will you stop with the cow and the elephant and the tree? You won't use this life? (Gestures) You will; you will have scientific ways of using them. Already it's happening in many different ways and it’ll get more and more. You do not know how to enhance the life, you know only how to use it. That is one kind of science, it brings convenience but it does not bring life. So we can consecrate an object – what is just stone right now will reverberate with a tremendous field of energy. If people come and just sit there, their lives are transformed. It is for this the temples were built. Temples are not a place of worship. Nobody is leading a prayer, there is no philosophy being propounded but they told you one thing, ‘If you go to the temple you must sit there for some time.’ Did they tell... did they tell you this? Hmm? Nobody told you, you have to send an application to God, but they told you, you must sit there for some time. Now these days you are just touching your bottom to the floor and running away, that is not the idea. This is like a public... public battery charging place. If the place is kept alive, if you sit there your life can transform itself, if it is properly created. I am talking about the ancient temples. Today’s temples, many of them are built like shopping complexes, probably for the same purpose; that’s a different thing. But if it's properly done, it is a phenomenally energizing space. Life can change, simply sitting there. You just come and sit in the Dhyanalinga for few minutes and see. People come there thinking they will sit for five minutes, they’ll sit there for hour, two hours, not knowing what is the time, simply because the very energy is like that. So temples were built for this purpose. Never, never in this culture did we fight on religious basis because we did not know what is religion till the outside religions came. You could do your God, I could do my God, everybody could do their own God and no problem. Only when people said, ‘This is the God,’ there is a fight, isn't it? It is very simple - what quality of water should go back into the river, we can set that condition. The city of Indore on the banks of the Khan river is the next stop on the rally. 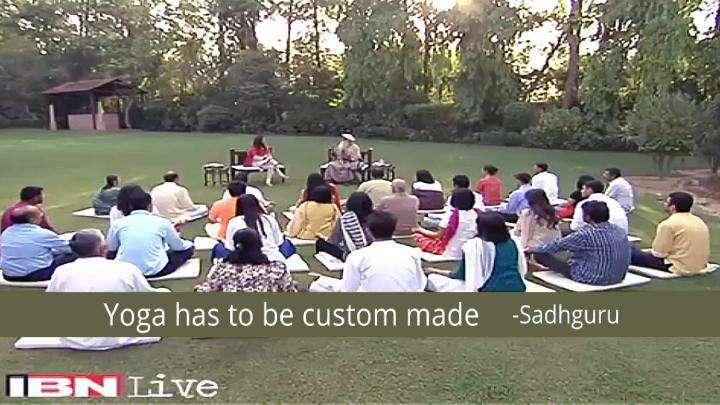 CNN-IBN interviews Sadhguru about International Yoga Day, the manifestation of yoga in today's world, and the profound nature of yogic science.